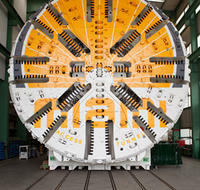 TBM cutting head face. Photo courtesy of Port of Miami Tunnel[/caption] Engineering News Record, the premier magazine serving the construction industry, made the Port of Miami Tunnel Project the cover story for its April 8, 2013 issue. This project, begun in 2010 and scheduled for completion in 2014, involves boring two 42.3-ft tunnels 4,200 feet long to connect the very busy Port of Miami with I-95 and I-395, thus channeling approximately 16,000 trucks per day away from local streets. Revere’s role in this complex project is to provide controls for the conveyors that take the excavated muck from the tunnel boring machine to the surface for transport to disposal points. The total amount of material removed by the boring machine is estimated to be 400,000 cubic yards. The 6-page ENR article provides extensive discussion of the many complexities involved in this project, including comprehensive geo-technical investigation and soil sampling, development and injection of a grout to stabilize the boring layers, and the development and testing of CSM (cutter soil mixing) concrete for the tunnel walls. The article is the first in a series of articles under the name Tunnel Titans, and it is an excellent read for anyone interested in understanding how big time tunnel boring is performed.